After a few days in Oludeniz you can’t help but be enticed by the colourful paragliders cruising above you performing daring tricks in the sky. I thought of flying and looking down over such a magnificent view. I was briefed to wear sturdy shoes and bring my camera. We met at the paragliding office by the beach and jumped into the truck to head up the mountain. We drove along the main road through the next resort and then peeled off up a road that looked like it just headed off into the forest. As the truck climbed the mountain road, through the pine tree forest, gaps in the trees revealed snatches of fantastic views over the settlement. The sheer drop just beyond those trees was somewhat alarming. It was a long and peaceful drive with the tourists taking in the view and the pilots smoking cigarettes. We arrived at the top and noticed an alarming sign displaying the rules of Turkish airspace. Were we that high up? Crikey. Our pilots supplied us with flying suits, which we got into excitedly and keenly sought a zip onto which we could tie our cameras. There’d be no retrieving them from a drop afterall. My pilot told me that once the wing was in the air I was to lean forward to counteract the pull of the wing and that once we were running towards the edge (yes you read that right) the most important thing to remember was not on any account to stop. Hmmm. Right. We watched as others were led partly down a loose scree slope, clambered into a harness and were clipped to their pilots. I watched a few smooth take offs where a few steps were all it took to get air-bourn and I watched a few scrappier looking takeoffs. Everyone got away, up, up and away though. Then it was our turn. My pilot clipped my harness to his in front of him and started to lift the wing. I leaned forwards and was told to “Go!” There I was leaning forwards and slipping and scrabbling over loose scree, fast approaching the edge of a near vertical slope. What the hell was I doing? A few steps later we were air-bourn and other than the wind whistling past our ears there wasn’t a sound. A rush of relief washed over me as I sat back in the harness and took in the view. And what a view it is. There I was hanging in the air 4,500m above the ground and sea beneath me, and lying in the lap of a stranger, virtually. The harness is fixed so that the pilot’s legs are either side of your hips, which is strange initially. Probably best not to think about it if you have personal space issues. We climbed thermals and could see over the Kaya-topped peninsular to Fethiye and Gocek. We flew out over the sea and were rewarded with an amazing view of the whole of Oludeniz beach, as well as Hisaronu and Ovacik behind it. My pilot showed me a few tricks. I enjoyed the wingovers but felt queasy doing spirals. It is easy to persuade pilots not to do tricks by the way; nobody likes cleaning vomit off their gear. As we approached the landing spot on the beachfront I could see some young lads waving pedestrians out of the way but of course one still ambled out and after a loud bark at close proximity from my pilot and an alarmed look from the pedestrian, said pedestrian dashed for cover as we whizzed past. Landing seems alarmingly fast. You approach quickly, but a last-minute tug of the breaks lifts you a fraction and slows you enough to step along the ground and allow the wing to collapse. I was in turn terrified and delighted with my first paragliding experience. I am lucky enough to have since been paragliding more times than I can remember with various pilot friends working in Oludeniz. It is an amazing experience and one that pretty much anyone can do. One of my pilot friends takes his daughter flying. She is five and loves it. Others have taken much older passengers. I managed to convince my Mum to have a go when she visited one year and she is scared of heights and suffers from motion sickness. I’m not sure it was the highlight of her trip exactly but she enjoys boasting about it now. 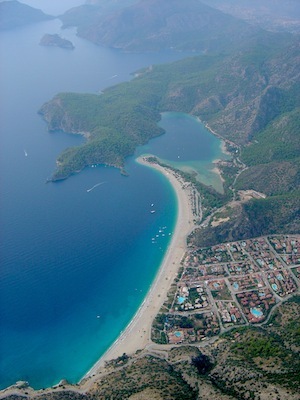 Paragliding is a fantastic experience and Oludeniz is definitely an amazing place to try it. The paragliders are so much a part of the place that on days when the weather is not on their side and the sky is empty the place feels strange. 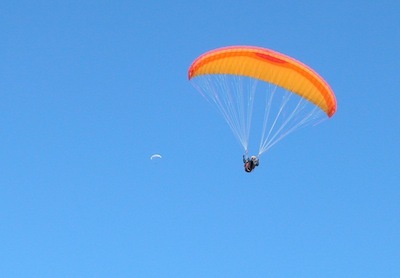 Have you been paragliding? How did you find it?